Example 1. 55 y.o. M with PSA = 4.5, prostate smooth on digital exam. Needle biopsy shows 5% of tissue replaced by Gleason 3+3=6 adenocarcinoma. Score = 5 points for needle biopsy; 2 points for % cancer; 3 points for PSA; 26 points for age. 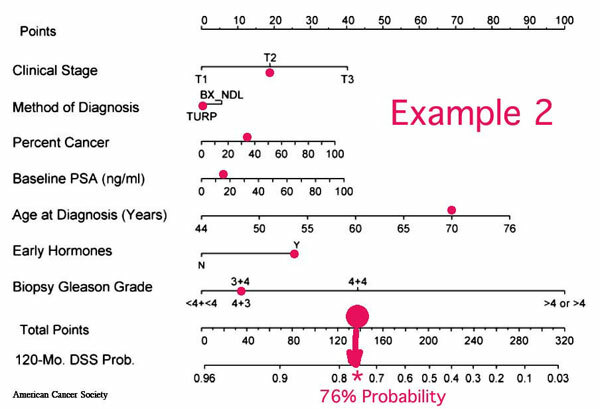 Total points = 36, giving a 94% probability of a disease specific survival at 10 years with no treatment. Example 2. 70 y.o. M with PSA = 15.0, prostate indurated on one side. 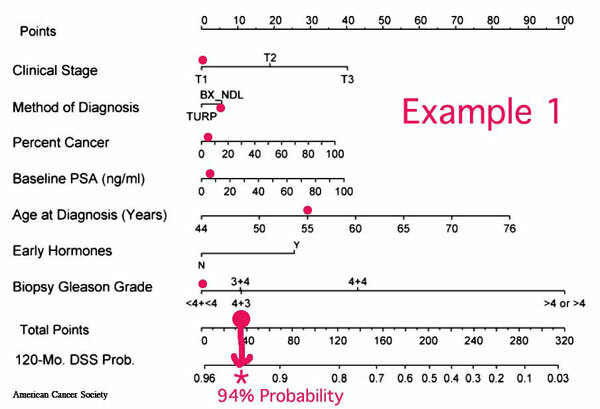 TURP shows ~1/3 of tissue replaced by Gleason 3+4=7 adenocarcinoma. Patient was started on a GNRH analog after TURP. Score = 18 points for stage; 13 points for % cancer; 5 points for PSA; 65 points for age; 26 points for early use of hormones; and 11 points for Gleason Grade. Total points = 138, giving a 76% probability of a disease specific survival at 10 years with no treatment.